When I decided to leave my full-time job in order to spend this year focused on writing, I didn’t expect it to be easy, I know making a career writing is hard work. But I guess what I didn’t expect was for it to be hard to actually focus on the writing process itself. It sounds easy right, or at least like fun. It sounds like the dream life, spending all day, everyday doing the one thing I want to do most. But it didn’t work that way. Some days I just didn’t feel like writing, couldn’t think of anything to write, or started stressing the money making part. Thing one thing that has really kept me motivated and writing even when I didn’t feel like it were attending writing workshops. Since I haven’t been making any money, my only option was to find free ones. Thankfully, The New York Writers Coalition had several different free workshops. While the workshops I attended were open to anybody, much of their work focuses on under served individuals in the city. They facilitate workshops for youth, seniors, women, LGBT communities, people living with disabilities, people who are incarcerated or have been incarcerated. While I have known about the organization for some time, even attended readings and entered a contest they held, I finally began attending the workshops this year. And it’s been incredible. In addition to writing a ton of new material I’ve also met some amazing people and shared some great moments with them. No matter how many days I wasted feeling sorry for myself, I could always look forward to the two hours a week (or more when I attended a couple a week) writing, sharing and listening to the writing of others. Because of how much I appreciate the work that goes into providing these workshops I’ve decided to participate in the Write Your A** Off fundraiser this year. My goal is to raise two hundred dollars, the minimum for me to participate in a day of workshops. Yes there is something in it for me but honestly I’d be doing this even if there wasn’t. I sincerely want to give back to this organization that has helped me so much. I’m hoping some of my blog readers can help me reach my goal. I don’t like asking others for help, especially monetary donations, but I believe this is worth it. 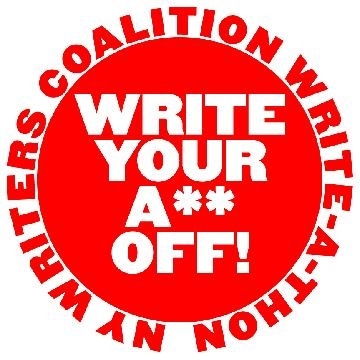 I just want to make sure that The New York Writers Coalition can keep doing their great work. If you’d like to donate please click this link, it will bring you to my fundraising page. I’m not asking a lot, even if it’s only a few dollars, every little bit will help me reach my goal. Lately I’ve been attending writing workshops. Luckily there are some that meet regularly and are free. The workshop leaders give us a prompt and a set time to write. At the end of the time we share what we wrote and comment on what we liked, what was memorable or anything else that might be helpful. You always have the option not to read or give any feedback, and there’s really no pressure. The best thing is they are very noncommittal, there is usually no sign up before hand and you can show up whenever you feel like it. Which is why I find it odd when people don’t seem to really want to be there. Well, maybe it’s not that they don’t want to be there but technically they really are not mentally there. I’ve seen people that instead of writing they are on their computer checking email, Facebook, or whatever else. Now on occasion I can see having the computer there distract you, and on occasion I’ll pull out my phone for a quick check. But I swear at least once I saw somebody spend the entire two hours surfing the web. Now I wonder why they bother to show up then. Not only does it seem like a waste of their time, but it’s pretty rude to the other participants. Instead of listening and participating in the discussion about the writing being done, they are basically just taking up space. I just have to wonder what goes through people’s minds when they do things like this. Is it that they just don’t care, don’t think others care, or that they just don’t realize what they are doing. I get it’s free, it’s not the most professional groups of people, and it’s not that serious. But it just seems, I don’t know, kind of wrong. Well maybe not wrong but it sure is pretty damn pointless to attend a writing group to do everything else except what you’re there for. So what do you think? I’m impressed with myself especially since I haven’t done much poetry writing in a long time. It actually came to me pretty quickly and easily. Well okay I did go back and edit some. (I had extra time) Even so the more important thing is I got writing and it was actually a really fun class. Carter, our instructor, was probably the only teacher that made poetry actually sound as fun as it should be. He was also funny and entertaining enough to make me think twice about signing up for the course. Then I remembered I don’t have money. Well there’s always another time, I hope.